One of the most touching stories of 2018 was that of Murray Swinton, the former firefighter who was suddenly struck down with Motor Neurone Disease (MND). A lifelong Collingwood supporter, Murray's story became a big part of last year's Queens Birthday game against Melbourne and the associated 'Big Freeze' day. 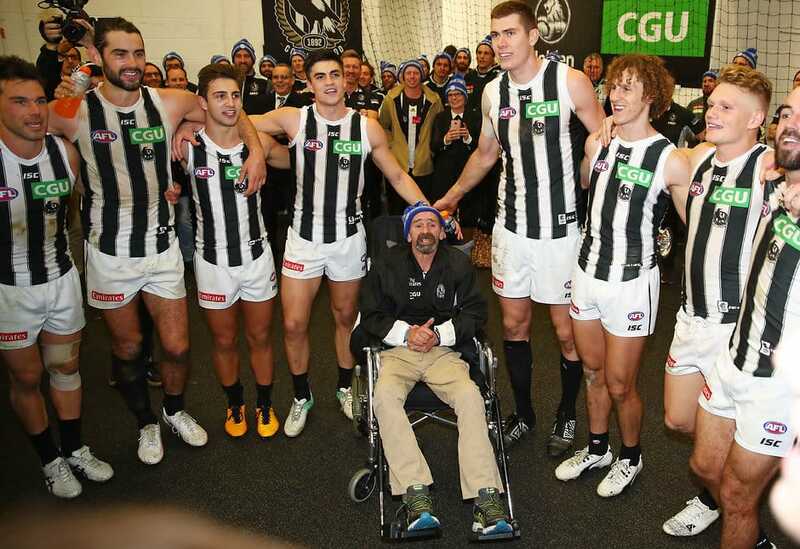 He addressed the players and coaching staff and became an inspiration to many of them: coach Nathan Buckley even wore Murray's firefighting helmet and gear when he went down the slide into the giant ice bath. Sadly, Murray lost his battle with MND late in the year. But his wife Tracie, and the rest of the Swinton family, have donated Murray's collection of Collingwood memorabilia to us. The highlight is an extraordinary run of scrapbooks that Murray kept every year from the mid-1970s. Meticulously maintained and lovingly detailed, the scrapbooks were Murray's pride and joy. Tracie said there was only ever one place that the scrapbooks were going to end up. "Murray just loved Collingwood, and he loved the idea that the scrapbooks he put so much passion and work into would be at the club forever," she said. "He started them when he was just a boy, but that childhood bit of fun became a lifelong obsession. It's so great that they'll be of use to others now. "Murray drew great strength from being side by side with Collingwood last year. It was something he never dreamt could have happened, but I know he cherished it until the very end. So I'm glad he's still going to be connected to the club in some way." The club's History and Archives Manager, Michael Roberts, welcomed the donation and said the scrapbooks were a treasure trove of information. "They will, of course, be a wonderful reference resource for generations to come," he said. "But more than that, they will also stand as a lasting testament to one man's great passion for, and devotion to, the Collingwood Football Club. We're proud to have them."